When selecting files one after the other, the preview for each file does not appear until after a brief moment. This is done to prevent the previews from being accessed, which can negatively affect performance. 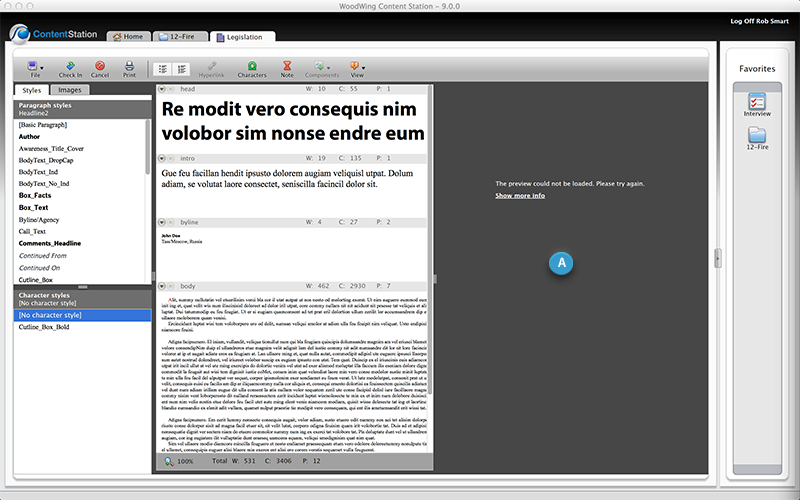 By default, the Multi-Channel Text Editor shows a preview pane in which a preview of the article as it is placed on the layout is shown. Creating such previews requires InDesign Server. When InDesign Server is not installed, the Article Preview pane can be removed, thereby preventing the preview pane from appearing unnecessarily. Figure: When article previews cannot be shown in the Multi-Channel Text Editor because InDesign Server is not installed, the Article Preview pane (A) can be removed altogether. PDFs with a file size of 1MB or smaller: the PDF is displayed with many of the Adobe Reader’s tools and context menus available (requires Adobe Reader or Adobe Acrobat to be installed). PDFs larger than 1MB: initially, only a preview is shown (typically the first page of the PDF) or in case no preview is available, a file icon. The user can download the full preview by hovering the mouse pointer over the PDF and clicking the Preview button that is then displayed. Figure: When previewing a PDF that is larger than 1MB, a small preview is shown at first. To preview the PDF in full, hover the mouse pointer over the preview and click the Preview button (A). Possible values: the maximum file size at which the automatic preview should be suppressed, defined in kilobytes.